Monday through Friday 9am - 4pm. The Parking Authority office accepts Visa & MasterCard credit card payments. Online renewal is only for existing customers. New customers need to visit the office to enroll. Monthly Permit Rate for all lots is $150.00/month. A $5 convenience fee is added for payments made online. An additional $25.00 Equipment Fee for your Electronic Tag is required for Garage/Lots: #1, #2, #5 and #6. This fee is refundable by check upon return of equipment. There is a $25.00 Fee for Lost or Damaged Equipment. To find a lot location to fit your needs, use our Interactive Map/Lot Locator. For availability or more information, please contact us directly. J. Christian Bollwage Parking Garage Lot #1, Lot #2 and Lot #6 daily rates are $2.00 first hour, $2.00 second hour/$1.00 each additional hour. A lost ticket fee is $20.00. See our Interactive Map/Lot Locator for information on operational hours per lot. Midtown Garage Lot #5 daily rates are: Up to 1 hour: $3.00, up to 2 hours: $4.00, up to 10 hours: $10.00, $1.00 an hour for each hour thereafter. A lost ticket fee is $20.00. See our Interactive Map/Lot Locator for information on operational hours per lot. Parking Meters found throughout city streets and at various lots are $.25 per 10 minutes. Metric box stations found throughout the city streets and flat lot locations charge $1.50 per hour. Hourly limits are posted. Meter bags shall be available for $25.00. For meter bag availability please call - 908-353-0949. 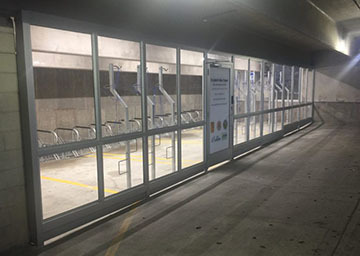 The Elizabeth NJ Transit Train Station has a Bike Depot which will provide you with safe, secure, covered storage for your bike while you are at work or visiting downtown Elizabeth. The Bike Depot is located on the first floor of the Midtown Parking Garage, 30 West Grand Street, and is equipped with a card key access control system and a surveillance camera. The Elizabeth Bike Depot also has a bike repair station. You must be a member to use the Bike Depot; monthly and annual memberships are available on a first-come, first-served basis. Once you join, your key fob will be sent to you through the mail. To join, please click here for English instructions. Motorcycles are permitted on the first level of garages. The Parking Authority of the City of Elizabeth is not responsible for loss, theft, or damages to vehicles or personal property at any of our parking facilities. Patrons are advised not to leave personal property such as cellular phones, radios, GPS, EZ Pass, cameras, clothes or other valuables in their vehicles. When parking at a metered space, a driver with a placard or handicapped license plate must put the appropriate amount of money in the meter. If the vehicle will occupy the space for more than the maximum amount that the meter holds, the driver must fill the meter to the maximum amount. All meters and / or meter boxes have maximum amounts posted on them. This will permit the vehicle to occupy the space for up to 24 hours, and no further payment will be required during that time. A municipality may require the vehicle to vacate the space after 24 hours. Effective APRIL 1, 2011. Tickets will be issued for non-compliance. This is a courtesy warning provided by the Parking Authority of the City of Elizabeth in compliance with state and local traffic laws.